Republican vice-presidential nominee Sarah Palin, the governor of Alaska, already is getting lots of attention for her stands on issues, her experience, her viewpoints, her family … and her eyeglasses, which are awesomely flattering, chic and modern. From one glasses-wearer to another, I say “thank you, Governor.” it’s about time a woman in the public eye (sorry about that!) wears glasses with style and without apology. However, I still can’t vote for her — but that doesn’t stop me from admiring her choices in eye-wear. Good for her. And does anyone else think she looks like Tina Fey, or is that just me? Or maybe Tina Fey looks like Sarah Palin. 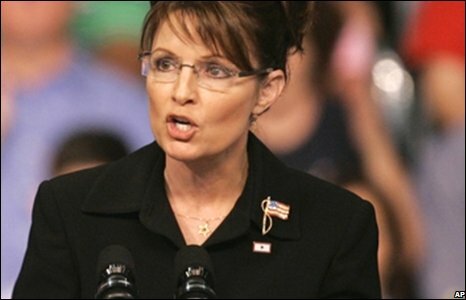 This entry was posted in fashion, Uncategorized and tagged fashion, Sarah Palin by Coffee with Cathy. Bookmark the permalink. Leah — Oh my gosh! I’m seeing the Mary Ann thing now. I hadn’t even thought about her, but after careful study I think you are so right. Stop expanding my mind and changing my perspective! Nothing good can come from that, you know.